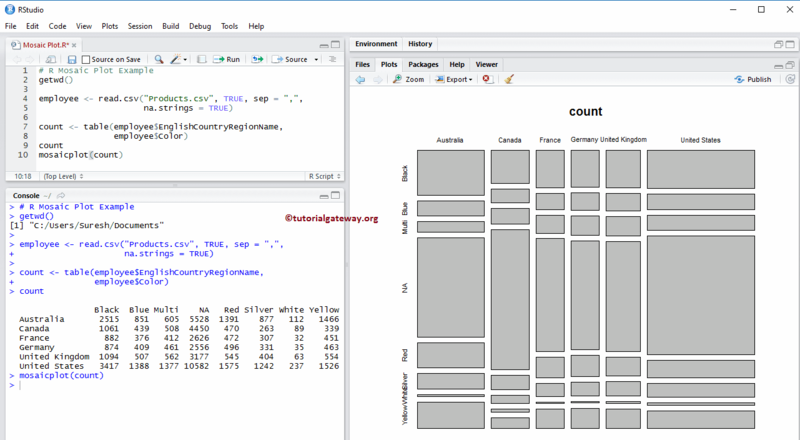 The Mosaic Plot in R Programming is very useful to visualize the data from contingency table, or two-way frequency table. It will draw a rectangles, and its height represent the proportional value. From the second example you can observe that, the White color products are least selling in all the countries. 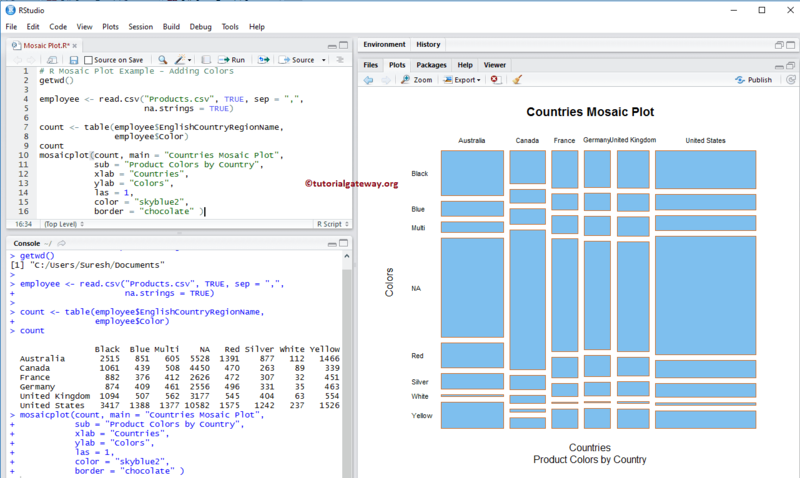 In this article we will show you, How to Create a Mosaic Plot in R, Format its color, borders, shades, and changing directions of the mosaic plot in R Programming language with example. 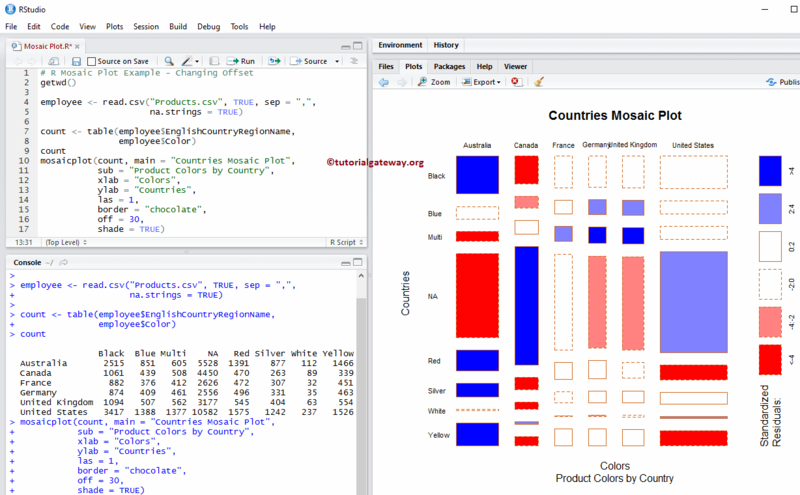 subset: You can restrict the Mosaic plot to draw some data, by specifying the vector of values. For example, you can restrict the Mosaic plot for Female population only. x: Please specify the data from which you want to draw the mosaic plot. Here, you have to use a contingency table in an Array form. You can use table() function to create a table from your DataFrame. margin: Please specify a list of Vectors with marginal totals. na.action: Here, you have to specify your stand on variables that contains NAs. By default mosaic plot omit the cases with NAs but you can use this argument to replace those NA values with more meaningful values. type: Please specify a character string indicating the residual type to be represented. 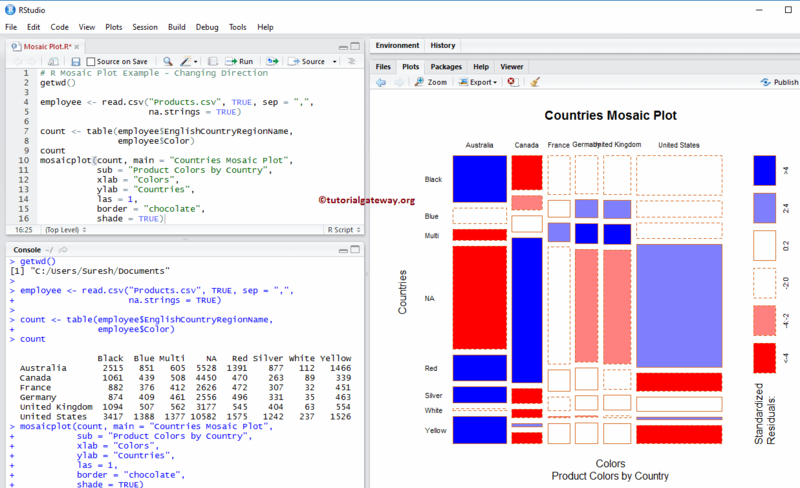 In this example we will show you, How to create a mosaic plot in R using the airquality data set, which is provided by the R Studio. 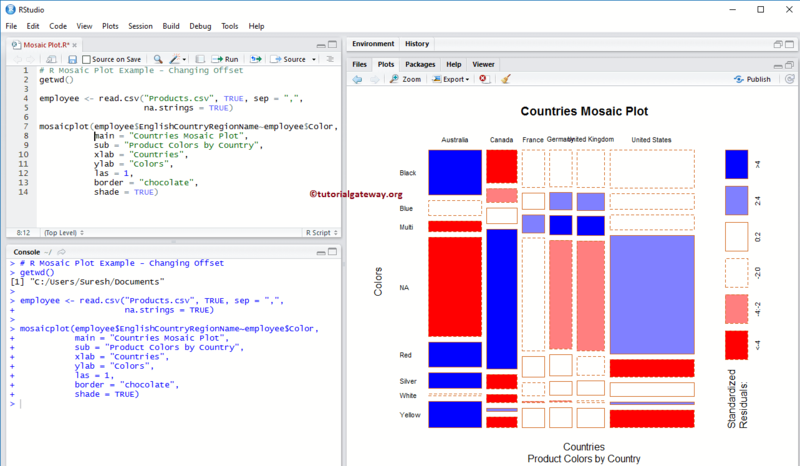 Next we used the mosaicplot function to draw the mosaic plot. 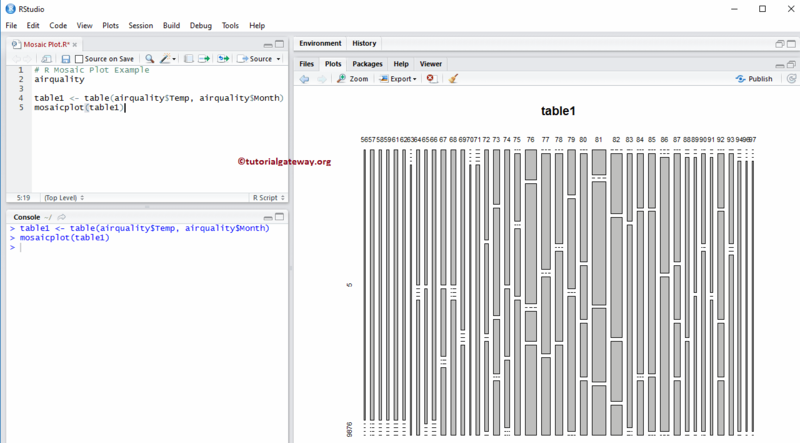 From the below code snippet you can observe that, we have used the table to draw the mosaic chart. From the below code snippet you can observe that, we used the table() function to create a table for Product Color, and the Country name. Above statement will return the output as a table. So, we are using that table to draw mosaic plot. main: You can change, or provide the character string for the Mosaic Plot Title. 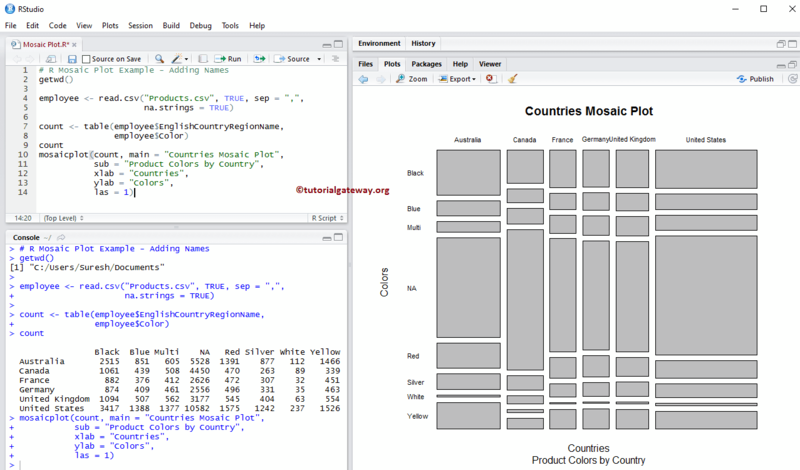 sub: You can provide the subtitle (if any) for your Mosaic Plot. In this example we will show you, How to change the Mosaics colors using color argument, and border color using border argument. border: Please specify the color you want to add for the borders. dir: Please specify a Vector of split directions for each level of mosaic. Here, “v” for Vertical, and “h” for horizontal. From the above screenshot you can observe that, we changed the Horizontal axis to Vertical and Vice-versa. shade: A logical value indicating whether to produce extended mosaic plot. You can also use a numeric vector of at most 5 positive numbers. off: Please specify a Vector of offset values to determine the percentage spacing at each level of mosaic plot. The default value is 20, and the approximate values are between 0 and 20. 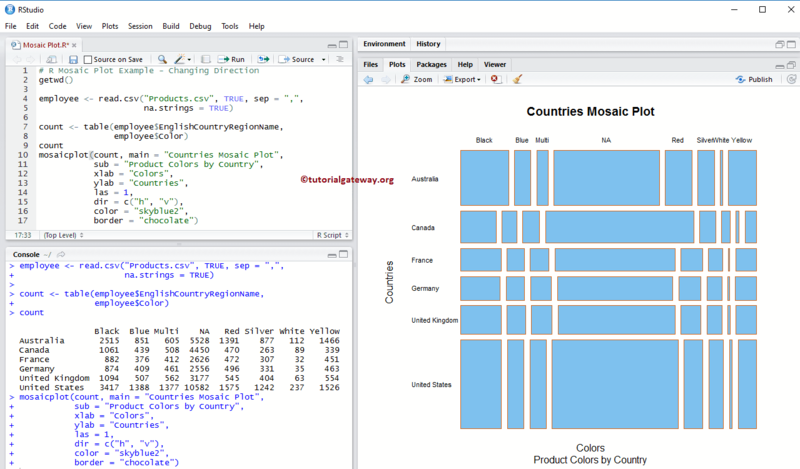 In this example we will show you, How to create a mosaic plot in R using the formula argument.